Cable glands are utilized in industrial and hazardous locations in the market. 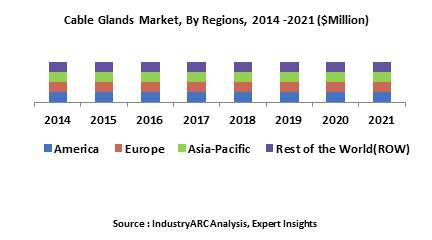 The global cable glands market was worth $1.808.5 million in 2017 and is expected to rise with a CAGR of 6.7% during the forecast period. The up gradation of existing networks, rise in construction and infrastructure development are considered as the major drivers in the cable gland industry. Cable glands are made up of steel, brass, plastic, nickel and nylon. Brass remained the significant material for fabricating cable glands and the revenue earned was $975m and is projected to command the market in the forecast period while plastic will follow as second most dominant material. In regard with the regions, America and Europe have very competitive market when compared APAC region due to the stringent regulations in the former’s market. Cable glands are critical devices that are required to safely pass a cable, wire or tube through an enclosure in a harsh environment and hence provide protection, sealing and grounding. They provide strain relief and act as a barrier during hazardous environment. They provide a secure connection between the cable and the machine which prevents the twisting and wear and tear of cables. Cable glands are designed for use with either armored or non-armored cable. They can be made of variety of materials such as plastic, brass, aluminum, nylon and stainless steel. Since the cable glands are designed for safety, it is important to have electrical safety specification ratings such as ATEX, CEC and NEC depending on the country of origin. What are the major applications of Cable Glands? The major end user industries of cable glands are manufacturing, chemicals, oils, aerospace, power and construction. Cable gland can act as a connector for electrical devices, data cables and telecom towers. It also provides high voltage cable connectors to transformers. They also act as a seal to prevent the entry of contaminants such as dust, dirt and fluids which may cause damage to the cable and electrical system. It also provides functions such as earthing, bonding, insulation and cable guarding. CMP Products has launched ‘Themis’ and ‘Solace’ fire resistant cable cleats which have been engineered and tested to withstand temperatures as high as 1000oC. These products have been designed for use with fire performance cables in order to safeguard the wiring system when affected by fire. It is made up of superior quality stainless steel making it suitable for indoor and outdoor applications. Schlemmer has re-engineered their ATEX Ex d/e/t cable glands series on the basis of updated ATEX standards and modified them according to the needs of customers. With this renewed series, they have reduced the weight and size of the gland in and improve their flame propagation and bending protection. Amphenol Industrial Operations has launched now a new series of rugged connectors for use in harsh environments. The LPT series is ideal for use in factory automation, automotive, hybrid electric vehicles or electric vehicles, energy storage, power distribution, industrial instrumentation and process control applications. This is light weight connector with an aluminum shell design. Who are the Major Players in Cable Gland market? The companies referred in the market research report include Eaton, Emerson, CMP products, Thomas and Betts, Cortem group, Waroem, Sealcon LLC, Jacob GmbH, Sealcon, LLC and more than 20 other companies.